There are many talented female golfers from all over the world. Many of them earn immense fame not only from their play but also by their stylish and beautiful figure. Few of them are the hottest female athletes in the world. Here is the complete list of top 15 hottest female golfers. 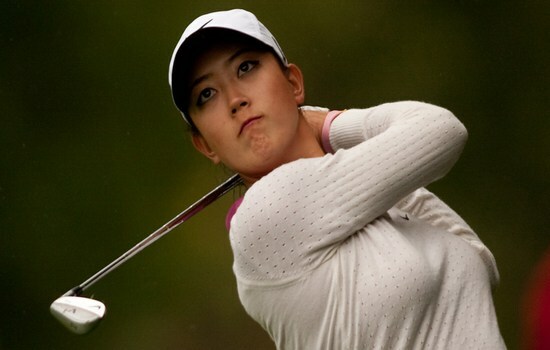 Michelle Sung Wie is an American professional golfer. She is one of the most popular golfers right now and for good reason. Michelle paved her golf destiny by winning both the Hawaii State Women’s Stroke Play Championship and the Kennie K. Wilson Women’s Invitational at eleven years old. At age 10, she became the youngest player to qualify for a USGA amateur championship. Wie also became the youngest winner of the U.S. Women’s Amateur Public Links and the youngest to qualify for a LPGA Tour event. At 14th spot we have Sara Brown. Brown started playing golf at the age of eight years old. she had a very successful amateur career .She is the Winner of the 2001 JGAA Player of the Year Award as well as Winner of the 2002 PGA Junior Series Player of the Year Award. Brown was Semi-finalist at the 2006 Women’s Amateur Public Links Championship and Two-time Michigan State University Female Athlete of the Yea. She also enjoys shopping, working out, watching movies, being outdoors, taking photos. The English sensation Melissa Rose Reid is next in our list. 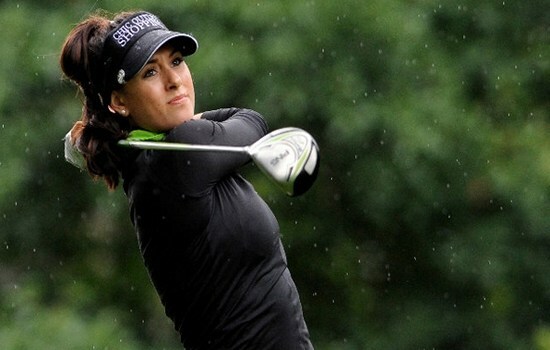 Melissa is an English professional golfer who plays on the Ladies European Tour. As an amateur she earned a lot of fame by wining several events including the 2004 and 2005 English Girls’ Championship, the 2006 and 2007 Helen Holm Trophy, the 2007 St Rule Trophy, and the 2007 British Amateur Strokeplay Championship. Melissa turned professional in late 2007 and started playing on the Ladies European Tour in 2008.she was named LET Rookie of the Year in 2008 .However, Reid’s first LET victory came in 2010 at the Turkish Airlines Ladies Open She followed that up with two wins in 2011 and was a member of the 2011 Solheim Cup team. 26 years old Sandra Gal is a German professional golfer who currently plays on the U.S.–based LPGA tour. Sandra At age 17 joined the German National Team and a year later she won the German National Girls Championship .In 2007 Sandra Gal won the Ladies European Amateur. In 2008 she turned professional .At LPGA Tour in 2011 gal won her first event at the Kia Classic. She won four events and was a two-time All-American while playing for the Gators .Other than the golf she is interested in tennis, ballet, violin, theater, painting and wake boarding. Next in our list of Top 15 Hottest Female Golfers is Beatriz Recari. Beatriz is a Spanish professional golfer on the U.S. based LPGA Tour and the Ladies European Tour. Recari started playing golf at age 11 and relished a fruitful amateur career, with wins at the 2004 Spanish Amateur Championship and the 2005 French Amateur Championship .She was also the runner up of British Girls Amateur Championship .She turned professional in 2005 at the age of 18.Recari recorded her first tournament win as a pro in her fourth LET season at the 2009 Finnair Masters. Other than the golf in March 2013, Beatriz was named an ambassador for The Alliance for Eating Disorders Awareness. Maria Balikoeva is a Russian professional golfer. Maria is the first Russian to become a full-time member of the Ladies European Tour. She participated in twelve events in her first season. In 2008, she rose up the ranks to earn 55th place on the New Star Money List by coming in fifth at the Tenerife Ladies Open. Her latest accomplishments have earned her the ability to represent Russia in various competitions worldwide. Belen Mozo is a professional golfer born on September 25, 1988 in Cadiz, Spain. The Spanish beauty gives credit to her mother who influenced her to pursue her dreams and to become a professional golfer. Belen was turned pro after winning both the Women’s British Amateur and British Girls Amateur Championships as an amateur player, a unique record that has been not achieved since 1972. This also directed her to qualify for the LPGA tours. Belen earned 28th spot at the Sunrise LPGA Taiwan Championship. The Indian beauty Sharmila Nicollet is on 7th spot in our list of Top 15 Hottest Female Golfers. She started her professional career in 2009 after being successful in various amateur tournaments. In 2012 she qualified for the Ladies European Tour. She is the youngest Indian golfer to qualify in the history of the game. She no doubt deserved a place in this list. Kathleen Ekey is an American professional golfer and she is currently playing on the LPGA Tour. She Started playing golf at the age of 3.Ekey enjoyed a successful collegiate golf career. Kathleen was a two-time All-Southeastern Conference First Team Selection (2008, 2009).she also Participated in four U.S. Women’s Amateur Championships (2005-2008) and two U.S. Women’s Open Championships (2008,2009).In 2009 Kathleen turned professional. In 2011 she won twice on the Symetra Tour season at the Ladies Titan Tire Challenge and Alliance Bank Golf Classic. Her Hobbies outside of golf includes dance, theater, football, hockey, and working out/ yoga, cooking, reading, and working with kids. Anna Rawson is an Australian professional golfer. Before starting her golf career she was a model. Rawson was the South Australian and Victoria Junior Champion as well as the winner of the Jack Newton International Junior Classic. She was the leading qualifier for the 1999 and 2000 Australian Amateur Championship and was a member of the 1999 Australian National Squad. Rawson turned professional at the end of 2004. She finished third in the Ladies European Tour of 2005. Natalie Anne Gulbis is an American professional golfer plays on the U.S.-based LPGA Tour. She played in her first LPGA Tour event in 1997 as an amateur at the age of 14 .she turned as a professional golfer in July 2001 at age 18.She placed in the top 10 in four successive major championships from the 2005 LPGA Championship to the 2006 Kraft Nabisco Championship. Natalie’s first professional triumph came at the July 2007 Evian Masters .she has played on three victorious U.S. Solheim Cup teams in 2005, 2007, and 2009. At 3rd place in our list is attractive 25-year-old Holly Sonders. Holly is a gifted college golfer. She is graduated from Michigan State in 2009. She has since become one of golf’s most recognizable television personalities .She has honor of wining two American Junior Golf Association wins reaching the round of 16 at the 2007 Women’s Western Amateur and helping Michigan State win the 2007 Big Ten Championship. British golfer, Sophie Horn, is one of the hottest female golfers indeed she is the hottest golfer of the year. Sophie Horn came to the public’s attention in 2010 when she was voted the sexiest woman in golf by a US magazine. In 2012, she was selected as the 3rd sexiest woman in sport in a worldwide poll. Perhaps today she is the hottest female athlete in the world. Although Sophie doesn’t play in the LPGA and she’s not quite yet a household name in America, but that’s not stopping Sophie Horn from quickly becoming the most popular female golfer on the planet.